The island of Vis has throughout history been ruled by various civilizations and been at one time its own nation; establishing a colony which is now Split. 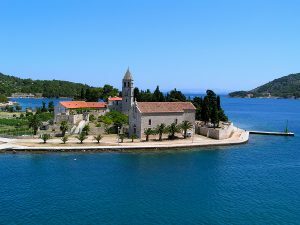 Otherwise, this island has been, throughout the millenniums, ruled by Greeks, Liburnians, Venetians, Italians and Austrians until becoming a part of Yugoslavia in 1920, and now a part of Croatia. Remnants of the various civilizations under which Vis was ruled are reflected in the local language, culture, architecture, and ruins found today on the island. 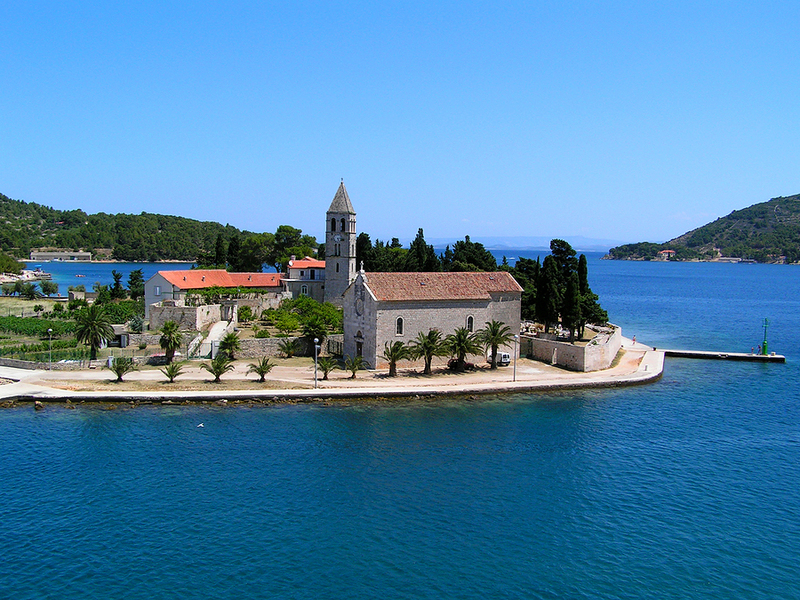 For any WWII buffs, Vis is the island where the general headquarters of Marshal Josip Broz Tito were located; the leader of the Yugoslav Partisan resistance movement which liberated the island from Italian and then German rule during WWII with the help of the British. It is probably being part of Yugoslavia that has made the most recent impact on the island, as Vis was a Yugoslavian military base and until 1989 was off limits to any foreign visitors, leaving the island frozen in time for decades so that today the island is considered decadently undeveloped. 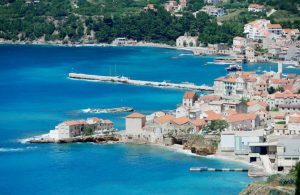 There are two main towns on Vis which are Komiza and Vis Town. 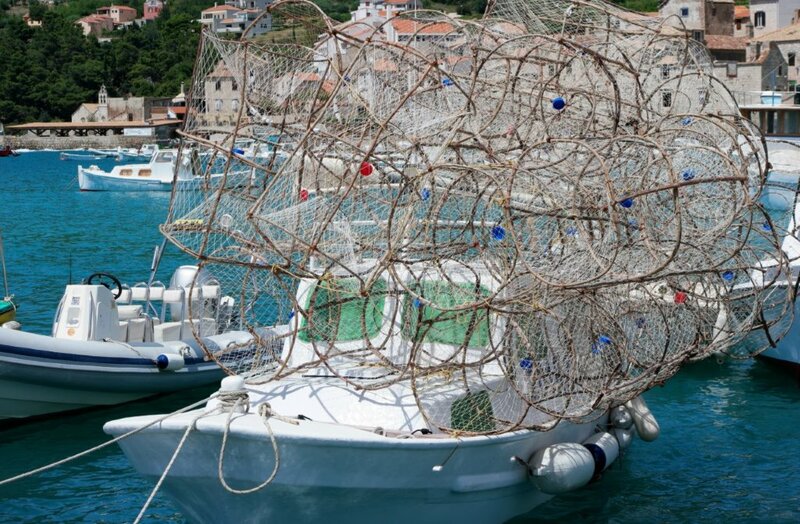 Komiza remains a very picturesque village, where many of the island’s lobster fishermen live. Piles of lobster pots can be seen on the quay ringing the town harbor. Two excellent restaurants, featuring lobster, which is the same lobster species fished for in Maine, are in Komiza, Jastozera and Bako, where a scrumptious dinner of lobster is always available, along with other menu items for non-shellfish eaters. In Vis Town, located in an Austrian Fortress built in 1841, is a terrific archeology museum, with the largest collection of Hellenistic artifacts in Croatia. The artifacts include ancient Greek pottery, jewelry and sculpture; including the highlight piece of sculpture, an outstanding 4th-century BC bronze head of the goddess Artemis. And don’t miss the displays of relics retrieved from shipwrecks as Vis was a very busy shipping island throughout history. 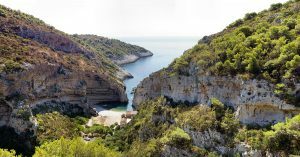 Highlights to visit by yacht on Vis Island are Stinivia Cove, an almost perfectly round protected cove, with a 10 meter opening for yachts to slide in an enjoy these peaceful waters. Surrounded by rugged terrain, overland access to this cove is extremely difficult. 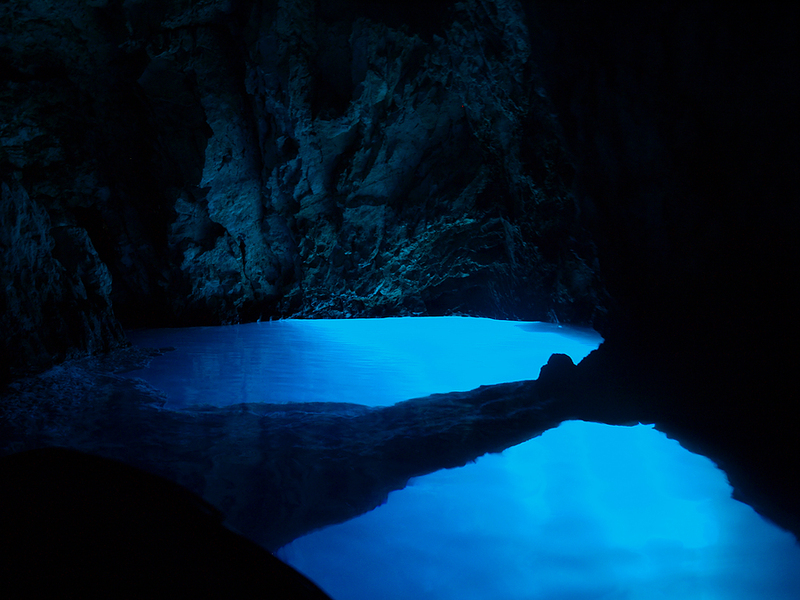 Close by on the island of Bisevo just off the Vis Island town of Komiza, is the Blue Grotto, where sunshine filtering through chinks in rocks forming the grotto give the water a lovely blue color. However, this is a busy attraction and not always available to enter depending on weather. Your Captain will check the possibility of entrance, and if possible, will also check if there is a wait time to be transferred to the Blue Grotto row boats to enter the cave, which is accompanied by an admission fee. A less crowded and inexpensive cave to visit is the Green Grotto, located on the tiny uninhabited islet of Ravnik, just off the coast from Rukavac. While this grotto does not have the ethereal lighting of the Blue Grotto, generally there are no lines, no entrance fee, and one can swim in the waters inside the Green Grotto. Close by the Green Grotto is the lovely beach of Srbrena. For hikers, there is a trail up Hum Mountain, where terrific panoramic views of Komiza are available. And a lovely sandy beach can be found in Zaglav after around a 15 minute hike. For ancient history buffs, there are Greek ruins from the 4th century BC of the Greek polis of Issa, a colony of Syracuse, Sicily. As with all Croatian islands, Vis has a number of boutique wineries whose wines are served in the local restaurants and wine bars. While there is much to see and do on this island, one can also totally relax, enjoy the beautiful water, and beaches while sipping beautiful Vis Island produced boutique wines when visiting Vis on a crewed yacht charter.